We have another Amazon giveaway for all our great fans! We are giving away a $75 Amazon gift card to one very lucky fan! 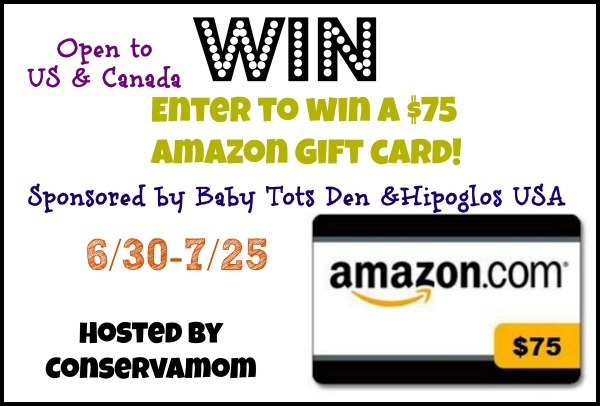 This giveaway is sponsored by Baby Tots Den & Hipoglos USA and hosted by Conservamom. What is your favorite thing about Amazon? We love Amazon prime and definitely get good use out of it! I would like to get an ice cream and frozen yogurt maker. But my granddaughter wants some kind of exercise thingy. Actually she’s begging me for it. So this GC would come in handy. I would use it for back to school shopping! I would use it towards household needs! I would buy some shoes. I would buy some reuseable cloth diapers for my granddaughter who is expecting her first child in November. I would get some more memory for my computer. I would like to use it for getting some linens. Hi! I would get a standing fan and something to decorate my new apartment. So fun! Thank-you for the chance!! I always buy things for my dog on Amazon like pill pockets or extracts! I would put it toward a Kindle for my grandson. I would put it towards a Kindle Fire HDX fr my Mom – she can use it for skyping her family and reading. I would use it for Christmas for my grandchildren. I would put it toward a Kindle Fire that I want. I would use this to purchase a anniversary present for my husband. If I were the lucky winner, I would put it towards a solar light kit for the teardrop trailer my husband is building. I would put it towards a Kindle Fire. I would either save it for Christmas to buy gifts or I would buy books and dvds!! I would buy DVD’s of A Game of Thrones. I would use it for the children’s school supplies. I would buy a new case for my Ipad! I would be most likely to purchase groceries with this gift card.